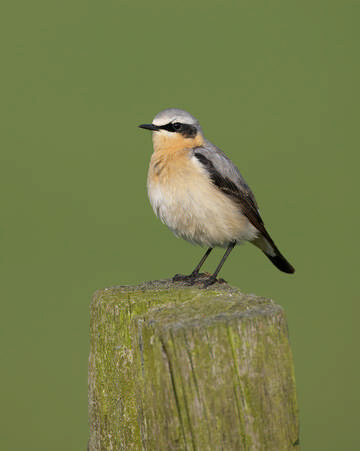 Wheatears are amongst the first summer migrants to return, eagerly awaited by many birdwatchers. They winter in Africa just south of the Sahel in a broad belt across the continent (Birds of Africa). No British-ringed bird has been found south of the Sahara, so their exact whereabouts are unknown, but they are probably in Senegal and Mali (Migration Atlas). On their return in spring, males arrive before females, and older birds before first-timers. It is not obvious why they migrate so early because they usually take several weeks before nesting. Perhaps Wheatears are driven north by the worsening conditions in Africa, the rising spring temperatures making their ground-based insect prey more difficult to catch (Conder 1989). Few of the Wheatears seen here stay to breed in the county. In the atlas map, many records of birds on passage complicate the picture, a lot of these being Greenland Wheatears Oenanthe oenanthe leucorrhoa, larger and more brightly coloured than the nominate race which breeds here. This species proved particularly tricky in attribution of ‘O’ or ‘H’ codes. Some birds can hang around for long periods in apparently suitable breeding habitat, often investigating possible nest-holes such as rabbit burrows, but not stay to breed. These records are mapped as ‘possible breeding’; some of them were recorded as ‘pairs’ on passage and these are ‘probable breeding’ on the distribution map. The only confirmed breeding records are in the eastern hills above about 300 m, and here their range has contracted since our First Atlas. The ‘change’ map for this species considers just the tetrads where breeding was proven in one or other Atlas and shows a clear loss from the northern part of the uplands. The reasons for this are not known but changes in the grazing régime are clearly implicated. Surveys of the South Pennines Moors SPA, of which the Cheshire moors are a part, showed a 55% drop between 1990 and 2004-05 in the breeding population of Wheatears (Eaton et al 2007). The loss from the lowlands of Cheshire and Wirral, in which there were three proven breeding records twenty years ago, reflects the national picture. By the time of the BTO’s second national Atlas (1988-91) there were clear range contractions from lowland Britain, tentatively attributed to losses of suitable grassland and declines in rabbit abundance. Wheatears depend on open areas with close-cropped grassland. They feed mostly on the ground, the usual technique being to hop and peck, birds often hopping several times before they see suitable prey. They eat a wide variety of adult invertebrates, ants, wasps, flies, beetles, spiders, molluscs, ranging from almost inert species to some that are quite fast-moving. They also occasionally fly, taking to the air to pursue insects, especially when they are swarming, and will hover briefly over a prey item. They nest in a hole, favourite sites being rabbit burrows, holes in walls, and underneath a pile of rubble, with the nest entrance normally chosen to be sheltered from the prevailing wind. The male bird stands guard whilst his mate builds a bulky foundation of roots, thin twigs and grasses, lining the nest with feathers. The nest is a long way down a tunnel, typically 0.5 m from the entrance, but is usually not at the end of the burrow, the female usually leaving space behind the nest in which she, and later on her well grown chicks, can hide if the nest is threatened by a predator. Five or six eggs are normally laid around the first week of May, with about half of Wheatear pairs having a second clutch in mid June. Despite their slow start to the season, once they start breeding they proceed with haste, and the females having second attempts start building and laying in a new nest almost as soon as the first brood chicks fledge. This is probably because, in common with most species, they time their breeding to coincide with peak availability of food for the chicks. Young birds get most of their energy from grasshoppers, bees, caterpillars and large files, with smaller prey, including spiders and ants, being fed to them in their first few days of life. Wheatears had not been well monitored by the annual national surveys until the BBS started in 1994. Since then, there is no clear trend in abundance. The Cheshire population has clearly fallen in the last twenty years and there are now likely to be only around 20-30 pairs of Wheatears breeding in the eastern hills.